I'm SUPER excited to say that we (Brite Collective) and Tricia Martin of Eating Is Art are hosting an event this Saturday, Oct 3rd. 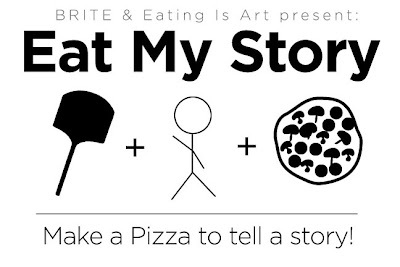 EAT MY STORY: Make a Pizza to Tell a Story! I've been looking forward in having Tricia come up from Portland to do a food event ever since I discovered her work in May. So I'm thrilled to see it all happening! 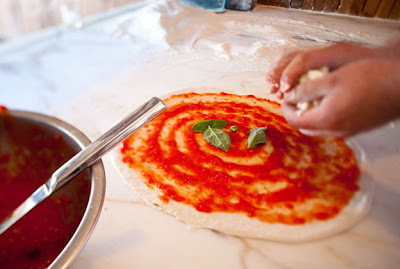 Every participant are to come up with a story as well as the ingredients for their pizza. The ingredients could have personal memories, cultural references, texture, history, smell, color, etc. The pizza could be savory, sweet, or in a shape of a pet! The possibilities are practically endless! Then on Saturday October 3rd, all the participants will gather at Via Tribunali in Georgetown to do a whole make/share/eat pizza feast! Wine will of course be part of it the equation. Doesn't it just sound horrible? On top of that, Tricia is making special pizza peel for each story! She's always so thoughtful and playful with all of the event she does. From the invitation, to the table setting and to the actual food itself...she considers all aspect to the experience that really makes each event feel really special. I'm SO looking forward to it! 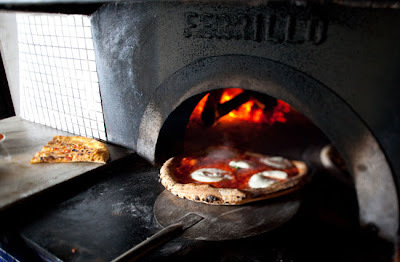 We're also incredibility thankful that Via Tribunali is being so generous by providing the venue and also letting as use their awesome brick oven to make pizzas....the right way. We still have few spots available, and you can still RSVP. So if you're in Seattle and would like to join us, please submit your story and ingredients (in less than 150 words) to tricia@eatingisart.com. Do so soon!! Chop chop!! 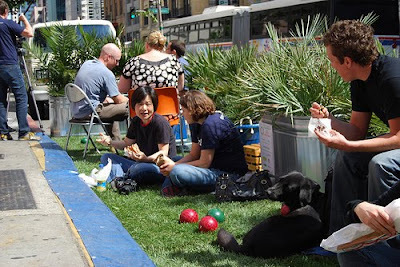 What a wonderful PARK(ing) Day! 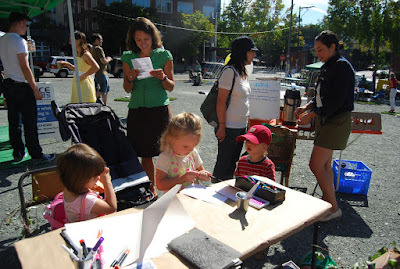 Last Friday, Christa, Julia and I organized a small BRITE event to take part in global PARK(ing) Day where hundreds of temporary mini parks were set up in actual parking spots or unused lots all around the world. The PARK(ing) day as a day to give the community a reason to hang out there again....and we couldn't have asked for any better weather than that day. 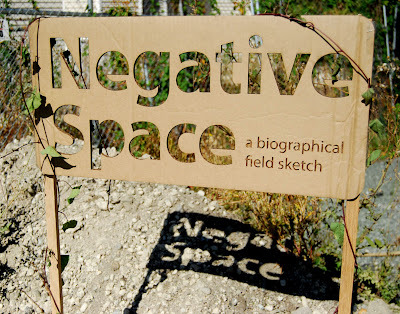 The Negative Space field sketch was inspired from a walk that Julia, Dylan and I did awhile back in July when Thomas Sieverts lead a walked around Burien....yeah, that's right...Burien. Who would of thought anyone can spend that much time there just wondering around, right? But after 2 hours of walking around, we left with thoughts and questions about other neighborhoods, and realized really how little we know and notice on a everyday basis....and inspirations to do other walks such as this. 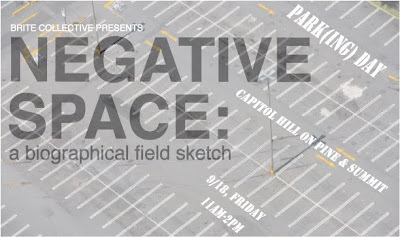 We wanted to take the opportunity of the PARK(ing) Day to get people to slow down and take a look at the Capitol Hill neighborhood. Especially in an area that has so much history, people, various types of businesses, and landscape, this neighborhood has gone through some major changes in the last 5 years (and still in process of). Some more controversial than others. While many of these issues have been presented as the good locals vs. evil developers, there has been many great positive improvements such as the Cal Anderson park where it has quickly became a common landmark for most residence/students/professional in the neighborhood to hangout. *So how have all the changes effected everyone's connection and perception about the area....are they positive/negative? neither/both? *How do each of those elements tie in to the way we associate with a place?...whether it be 4 block radius, a neighborhood, the city, or the entire country. *How do we, as an individual make a place more pleasant for yourself...and if possible, for others? People participated on different levels depending on the time allowed. Many came by to say hello or during their lunch breaks draw up some quick cognitive memory maps of what they know about the area. Here's a whole line of the hung up. 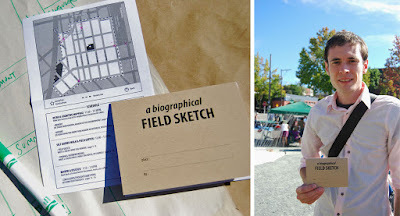 For those who had more time, we then gave them each a special "biographical field sketch book" as they went on a self-guided walk jotting down what they noticed. Constance' conclusion: Pay Attention. (Constance came back and admitted that she spent half the walk looking for her car trying to feed the meter and got even more turned around) Jonhathan's Field Sketch: Great old buildings. 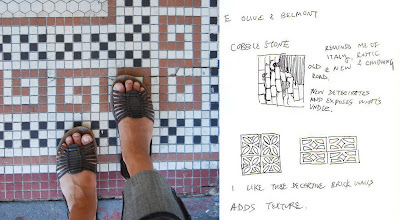 (as an architect, he appreciates the old charming buildings of Capitol Hill) My findings: Great mix of pattern & texture that reminded me of Italy. We even got some young BRITE participants! How cute! 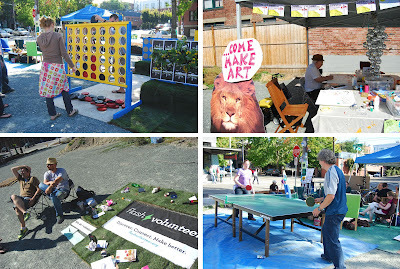 A giant connect four, a table to make some art, Flash Volunteer, and a ping-pong table. 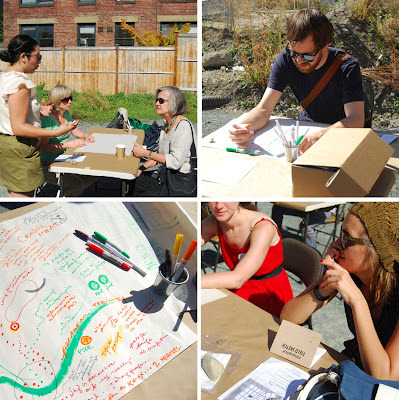 Check out the Flickr set for more photos of the event and people's field sketch notes! If you like to join BRITE's mailing list to hear about our updates, please leave a message with your email on our Facebook page. 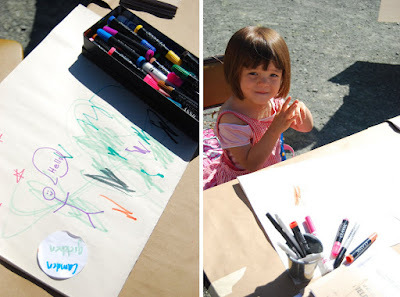 As part of BRITE Collective, Dylan and I are excited to be taking part in this Friday's PARK(ing) Day! We are co-leading a neighborhood walk with Christa (of Cafe Weekend) and Julia Levitt (editor of Worldchanging). 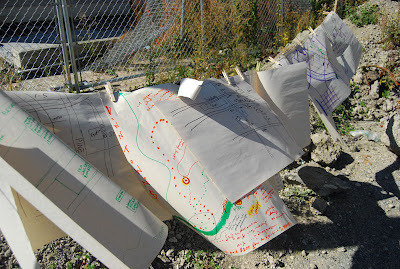 1-hour interpretive walk along the Pike / Pine corridor (West of Broadway). 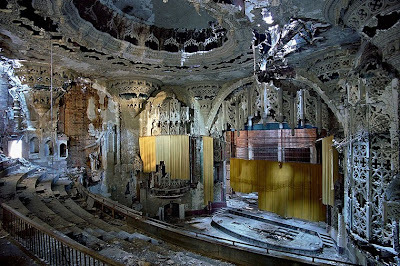 We will explore, examine and share our collective memories that identify this place. As we walk, we will discover new ways of viewing familiar places. Participants will receive a field journal to help guide and record their unique experience. Come to the event if you're in Seattle! 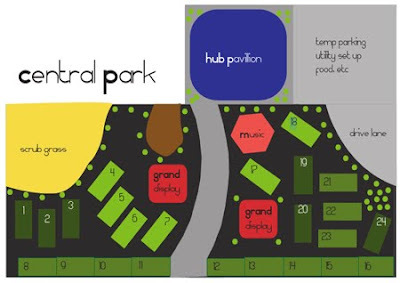 There will be tons of other mini-parks, music, and food venues at the Central Park. Should be Lots-O-Fun!! 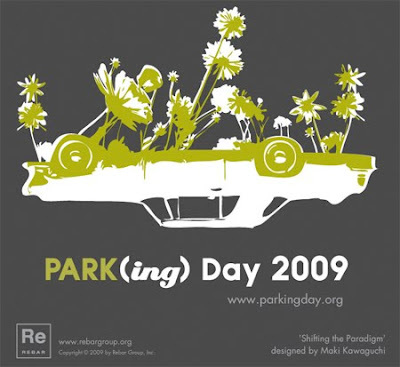 For those of you who are just learning about this, PARK(ing) Day is an annual, one-day global event where artists, activists and citizens collaborate to temporarily transform metered parking spots into “PARK(ing)” spaces: temporary public parks. It's gonna be everywhere! 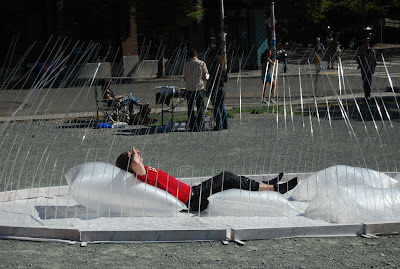 Click, here to see if there's any PARK(ing) spaces happening around you. This would be a good excuse to walk slower or stop and hang out just for the hell of it. Oh boy, I can't wait to see the faces of the drivers looking for parking spots as I take up the whole spot to get a nice sun tan. It's gonna be fun. This IS what is all about, right? With summer theoretically behind us (the rain is back with a vengeance), it's time to catch up on all the blog posts we meant to do but instead ended up avoiding the computer screen for one reason or another. 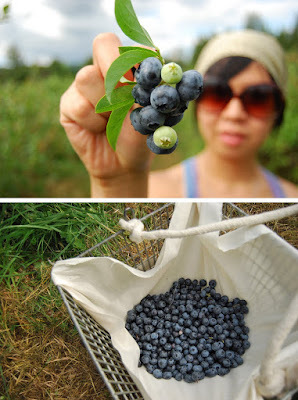 We'd been meaning to go berry picking for years and somehow never got a around to actually going. At long last on a magically fine weathered Sunday afternoon last month we finally decided to pack it up, head to the country and pick us some berry goodness. Cue the dreamy sound bite: doodelet, doodelet, doodelet (yes, I'm waiving my hands a la Wayne's World). Let me start by noting that as alluded to above that our berry picking prowess has diminished over the years. 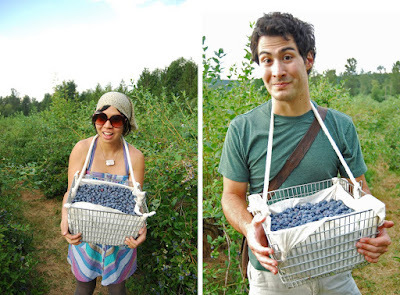 First "mistake" was that we somehow talked ourselves into thinking that it was BYO bucket, so Jean being the crafty genius she is fashioned these stylish berry picking baskets using some old locker baskets and cotton rope. The result was easy to tote, high capacity (more on this later) baskets that put any gallon plastic bucket to shame. We arrived at Bybee Nims Blueberry farm, an exclusively blueberry farm at the foot of Mt Si in North Bend, WA about 60 mins East of Seattle. The scenery at the farm was amazing with the mountain jutting into the sky behind the shimmering blueberry fields. All the while not realizing (second "mistake") the capacity of our homemade baskets. We set our goal to fill them and aggressively, successfully met it. 3 hours later, we were riding off into the sunset back to Ballard with the trunk filled with 30 lbs of delicious blueberries.....and $50 less in our wallet. Ouch! What the hell were we going to do with them all?? Well...if you REALLY want to know. We were literally eating them fist full at a time. I gave couple of pounds to all our friends. 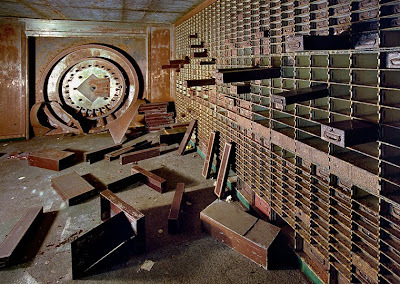 I'd drop a few on the floor and would just throw since we had such abundance of them! That's like what rich people do, right? I also decided to try this Blueberry muffin recipe from Tricia! Super yummy! I especially enjoyed the taste of the hidden sugar lemon topping! Then from the muffins, I decided to bake a blueberry pie. It's been at least 9 years since I made a pie from scratch!! I used to make them all the time in high school when I took a catering class. Oh....wait, I take that back...I guess I did make pie this year....does Frito Pie count? oh yeah...duh, of course!! Why did I even ask!! I used this recipe from Martha. It's just a simple blueberry pie recipe. I forgot how much fun it was to make.....I like rolling out the crust part. I was totally excited to use my marble "Gourmet Rolling Pin!" seriously though...a pie is not good unless the word "gourmet" is part of it. So...I guess that means my pie is officially a "Gourmet Blueberry Pie!" 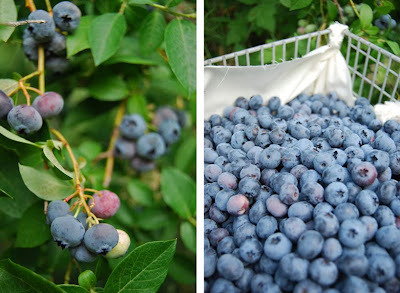 It totally does sound 10 times better than just a blueberry pie! .....Blueberry pie....Pheh! That just sounds like a pie offered at some truck stop that's been sitting in spinning pie case for days....probably baked in factory that uses a processed mixture with at least 2 pounds of sugar, high-fructose corn syrup, swine flu infested hormones, and 0.1% real blueberries...Who can eat that!? No thank you! Just a reminder to readers to check out the blog's new home at ladiesandgentlemenstudio.com the soon to be exclusive home of the L&G blog. 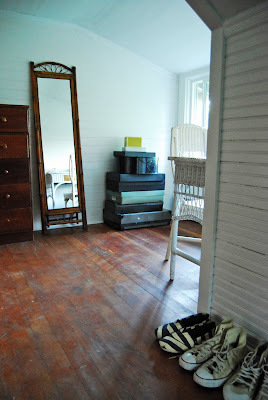 We'll be posting to the blogger for a few more weeks along with the new location then make the switch over for good. 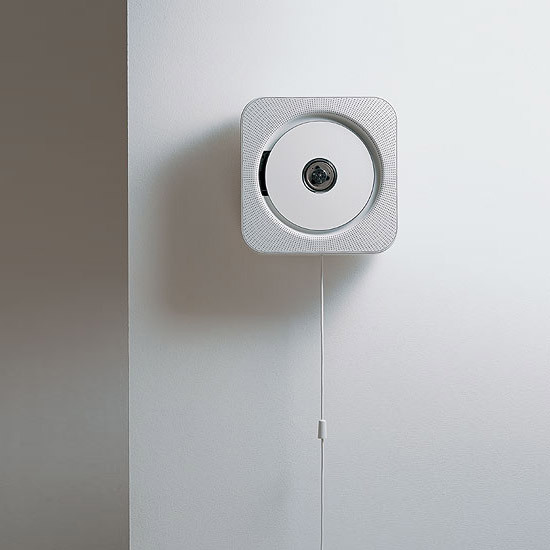 4 years ago Jean made one of my wildest fantasies come true...you know the one about owning a wall mounted Naoto Fukasawa Muji CD player (which at the time was not available in the US). She had so thoughtfully picked it up on a trip back to Taiwan, lugged across the Pacific Ocean, wrapped it up with care, and presented it to me with pride...What a women! It sat so proudly on the wall occasionally playing a CD, but mainly just looking totally awesome until one day I went to pull that so-satisifying-to-pull power cord only to have nothing happen! :( I was told by a local repair shop that it couldn't be repaired. Double :( !! All the instructions are located here. 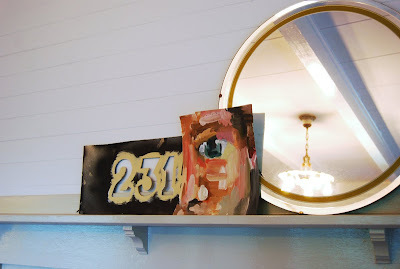 Looks like a fun, but involved project! If done right, it just might quench the urge for the real thing. I'll take one building, please. 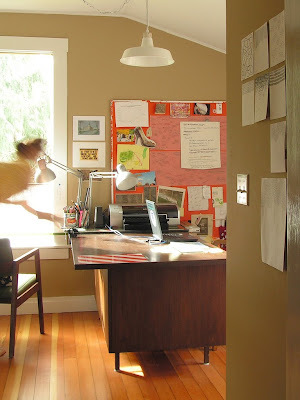 I saw this through Jamie's blog (designmate) and HAD to share this, too. These are photos taken by Yves and Romain. 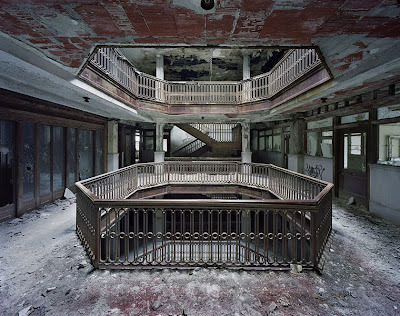 The series "Ruins of Detroit" captures all the vacant, desolate, eerie, yet unreal sites and buildings around Detroit. I'm jealous that they got to go into the buildings, since that's what I wanted to do when Dylan and I was last there. Dylan and I went to Michigan last summer and spent 3 days walking around Detroit where we got the full Detroit experience. You can read our travel story, here. 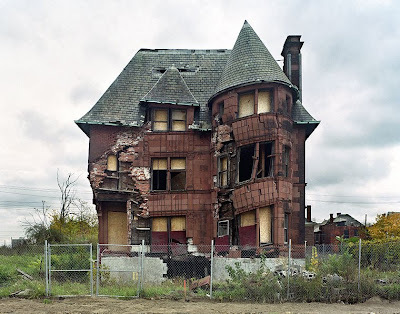 Lesson of the story....DON'T SKIMP ON ACCOMMODATION IN DETROIT! 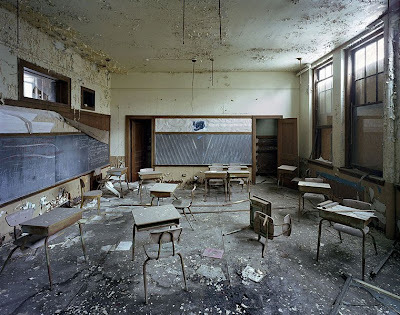 I just remember of Detroit from day of arrival to the day we left....was the abnormal silence all around.....the empty buildings, the scattered silhouettes of people walking really slow and swaying, the wide streets with barely any cars. I felt like we were in another dimension... 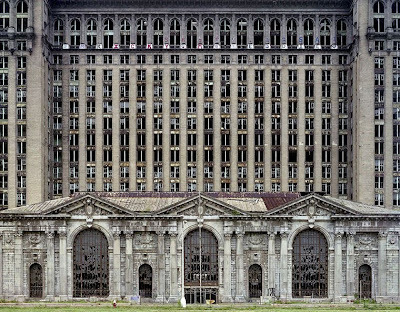 The Michigan Central Station was especially ominous. It's a GIGANTIC stand-alone building with nothing else around. I can only dream of what it's like inside....I wanted to sneak in there so bad!! They all look like the perfect horror movie sets....like SAW or something... SAW XXII or whatever. 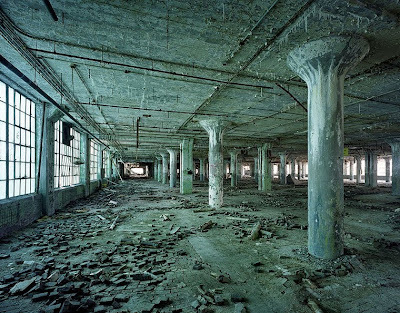 You also gotta watch this footage of this exact building falling down on its own. Insane. I wish the state of Michigan would advertise Detroit more on those "Pure Michigan" vacation commercials! You know they can just insert the clip of the fallen building after some scene of a couple on the yacht or something. I'd go back just to see those buildings and take more photos...or even buy a building while I'm at it. Welcome to our very first JOIN Design Profile. On behalf of JOIN, Dylan and I will interview talented and emerging designers and visit their studio and homes starting in the Northwest region. 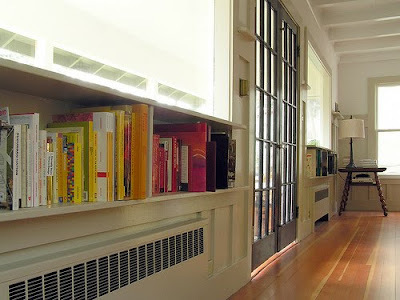 Our goal is to share a little something about each designer's work, personality, work/living space, and design philosophy. 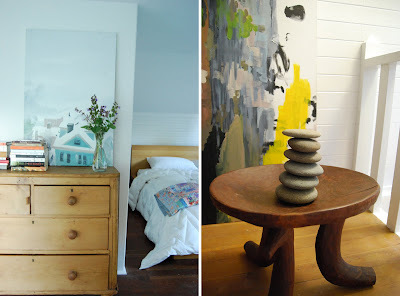 Today we’ll be featuring Bainbridge Island-based design all-stars, Grain. 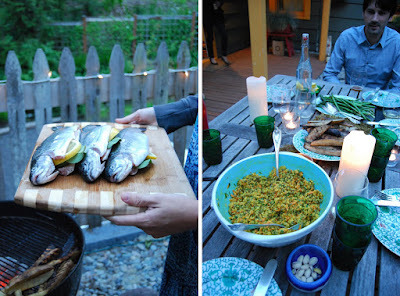 We had the extreme pleasure of enjoying a perfect summer BBQ evening at their picturesque 1901 island home situated a short ferry ride west of downtown Seattle. 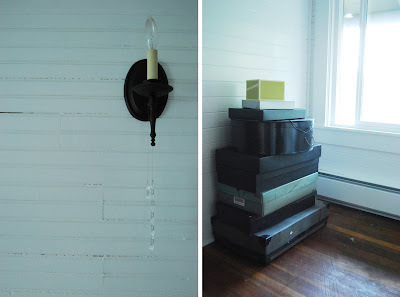 Grain partners, James and Chelsea, live and work out of the home and adjoined workshop, which they have renovated and decorated to perfectly reflect their appreciation of the home’s character, but also their clean modern style. They prepared an amazing meal, which we enjoyed on their wooded porch. What an inspiring setting to design in. When Grain isn’t enjoying laid-back island living, they’re busy working away as a design studio and consultancy with an ecological focus (easy to understand their appreciation of the earth given their surroundings). Grain’s goal is to help clients develop sustainable solutions that have a positive effect on humanity on a social and global scale. Each of the four members of the collaborative can trace their roots back to Rhode Island School of Design where they first developed their approach to sustainable endeavors. 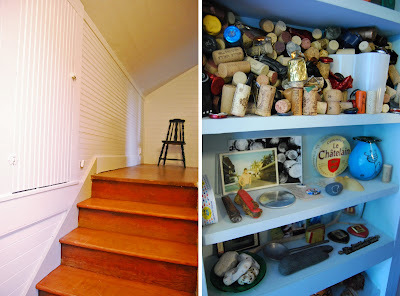 Their diverse body of past work ranges from furniture to socio-cultural documentation and more. They also have a budding collection of their own products that includes the simply clever Ty shower curtain (made from durable, recyclable and water-repellent Tyvek). Grain is also in the unique situation of operating on both coasts with half its workforce on Bainbridge (Chelsea Green and James Minola) and half on the East Coast (Brit Klienman and Sami Nerenberg). While working at a distance can have its challenges, Grain sees the arrangement as an advantage, allowing them to meet their client’s needs from multiple perspectives and locations. We spoke to partner Chelsea Green to learn more about what makes Grain tick. Location: Grain is based on Bainbridge Island, which is a 35 minute ferry ride from downtown Seattle. 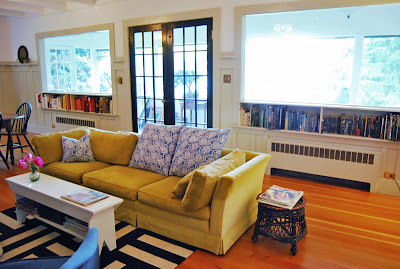 We also have designers available in Boston and New York. What's the story behind your (company/studio), how did it start? James first conceived of the consultancy while we were all still students in the Industrial Design Department at Rhode Island School of Design (RISD). He invited us all to participate. At first he was the only full-time Grain employee. In 2008 I began working full-time for Grain as well. 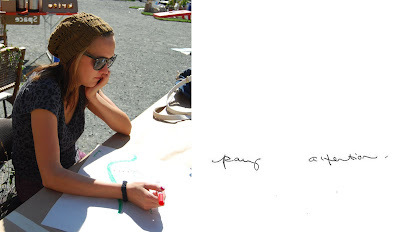 Along with being our Sustainable Systems Strategist, Sami is the youngest adjunct faculty member in the Industrial Design Department at RISD, where she teaches the popular Design for Social Entrepreneurship studio. Brit works full-time for Jack Spade, is the creative force behind AVO Market and designs for Grain. What's your design philosophy and approach? We focus on uniting sustainability and business through design. We believe that there is an inherent responsibility in the practice of design. We approach every design problem through a rigorous and systematic process - always considering the social and environmental benefits and affects of the work that we do. What are some highlights (life changing events) you've experienced that influenced your current work or philosophy? We all come from different backgrounds which have led us individually towards design and focus in sustainability. My background was luxury interior design. I had enormous conflicts with using my design thinking merely to facilitate conspicuous consumption. I loved the opportunities for creative expression that the seemingly limitless project budges allowed me, but at the end of the day I felt unfulfilled as the work required me to turn a blind eye to some of the larger social and environmental realities of the world. I believe design has the capacity to promote positive changes-to inspire and be catalyst for good. I want to spend my short time on this planet working on projects that are in line with this belief. What do you consider your most successful and or rewarding project? For me, one of the most rewarding projects that we’ve worked on together happened before we even became an official collective. It was Bridging Cultures Through Design, the wintersession course at RISD in which James, Brit and I met. It was led by designer and educator Mimi Robinson, who has worked for years helping artisan groups bring sustainable products to market. 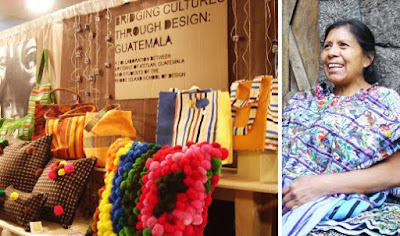 After a month of studying Guatemalan artisan techniques and traditions, we traveled in a group of nine RISD students to the communities of San Antonio Palopo and Santiago Atitlan in Guatemala to create a collection of textile-based products for contemporary markets. The goal of the project was to build sustainable income opportunities for the artisan communities that we worked with – providing them with design ideas to help build future collections. As a group, we developed over 60 products (many that are still in production) that were launched at the New York International Gift Fair. Getting to experience the whole process of authentic research, culturally and environmentally sensitive product development and the economic forces that influence everything, really opened our eyes to how impactful design can be. On top of it all, it was the project that led us to meet each other! I personally get a lot of inspiration by going back to New York (my home of 7 years) to be with friends who are in similar places in their careers and creative work. I also have family in London that I like to visit often. It is such a gritty, diverse and creative environment for me. We get a lot of inspiration from living here in the Northwest as well. There is just so much awe-inspiring natural beauty. Its influence is ever present. What do you like to do when you need a break from design? James and I have to remind ourselves to get out there. Because we live and work in one place (on an island no less) and are a couple, we spend the majority of our time together and in work mode. We get that guilty feeling that a lot of young entrepreneurs experience when they steal time away from their work. That said, we are learning to create more balance. We spend a lot of time outdoors since moving back to the Northwest. Walking, hiking and beach lounging are a major part of our repertoire and definitely get us out of the office. I am also pretty dedicated to practicing yoga several times a week and spending several hours with The New York Times on Sunday. 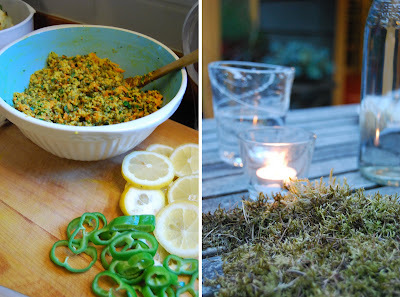 We also love food: foraging, cooking, reading about and experimenting with. We have a so-so vegetable garden, though it seems to get better each year. 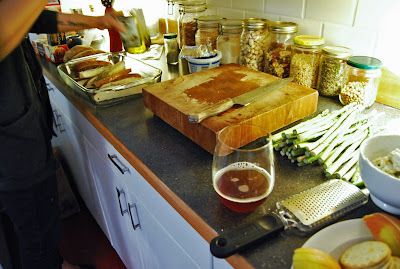 We also belong to a CSA so we have access to a lot of spectacular local produce to play with. We have lemoncello working its magic as I write and beer and wine making on our to-do list this year. The most important objects that I own are all sentimental. 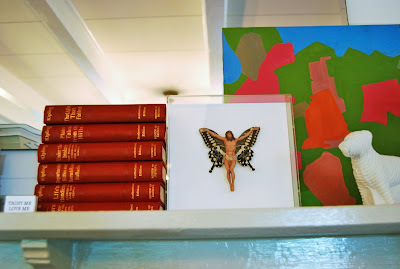 Photos, love letters, old journals, sketchbooks and jewelry that I have been given by family and friends. They would be the things I grab in a fire. That and my hard drive. What's your favorite, well-designed food? why? Um, this could be a long list... Generally, I prefer simply prepared foods that celebrate ingredients at their finest. A caprese salad of heirloom tomatoes and fresh mozzarella with basil from the garden and great olive oil and balsamic comes to mind. When prepared properly, it just lets each ingredient shine and fills you with the taste of summer. In winter, we also make this slow cooked bolognese that is so rich you almost have to lie down after a bowl of it over pasta. It has these deep flavors (from the red wine, pancetta, etc.) that just continue to reveal themselves with each new bite. 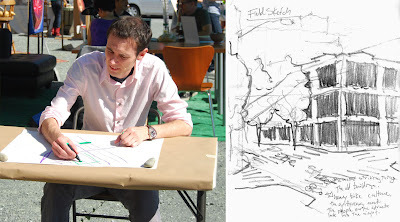 What are the strengths of design in the Northwest? How do you see it becoming stronger? 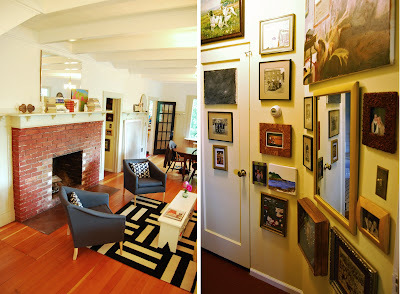 There is a lot of great design happening in the Northwest. The tricky part is getting to know what’s going on beyond the surface. Becoming involved with JOIN has made a major impact on how connected we now feel to the Northwest design community - which is really important to us as we think about growing our business here. 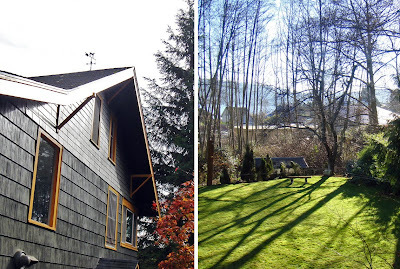 In an effort to educate myself on contemporary art and design in the Northwest, I began a blog in late 2008 called Village Mews as a way to archive everything I was stumbling across in my own personal research. In doing this, I thought I would begin to get a more cohesive picture of the Northwest design scene. Almost a year later, I am not sure if I can summarize it into a neat package. That said, there are some themes that begin to bubble up. 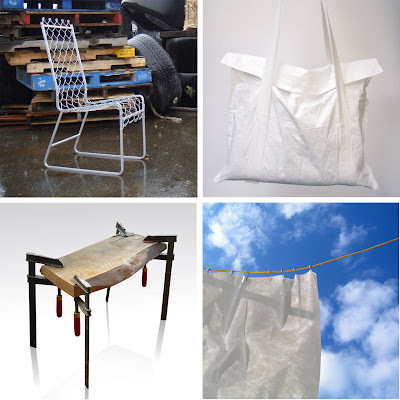 One is materiality; there is definitely a consciousness to the way designers here think about their use of material – whether it be reclaimed, sustainably sourced, or locally produced. 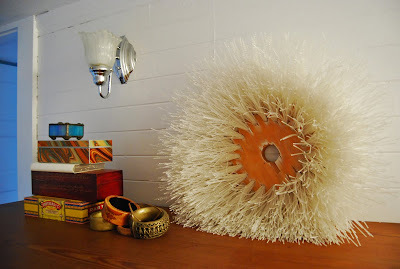 Secondly, in the process of making, there seems to be a strong D.I.Y./craft/handmade affinity. Also, here in Seattle at least, it feels like a lot of designers try to leverage the tremendously rich manufacturing/production processes available locally in their work. 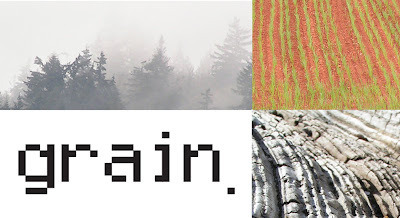 These themes are not necessarily unique to the Pacific Northwest, but they are the themes that I would identify with Northwest design if I had to make some unifying connections. If I were selecting a couple adjectives to describe designers here, I would probably pick authentic, straightforward and resourceful. As far as strengthening design in the Northwest, I think the efforts of JOIN are going to be a catalyst - bringing together the disparate work of our regional designers. 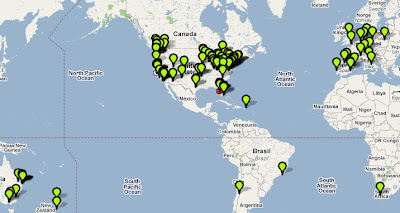 This should help us more clearly define our collective efforts and get the word out about what we do so well here. Through the grey and gloom that we are infamous for, I think the future looks bright for Northwest design.